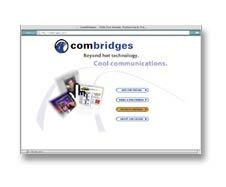 ComBridges is a video and web development studio based in Marin County, CA. As the Senior Webmaster reporting directly to Jon Leland, ComBridges founder and president, Loris Scagliarini designed and developed numerous web sites as well as effective web graphics and animation. In addition, Loris effected ongoing updates and maintenance for several client web sites. The following is a partial list of recent web sites designed and / or produced and maintained by Loris for ComBridges.